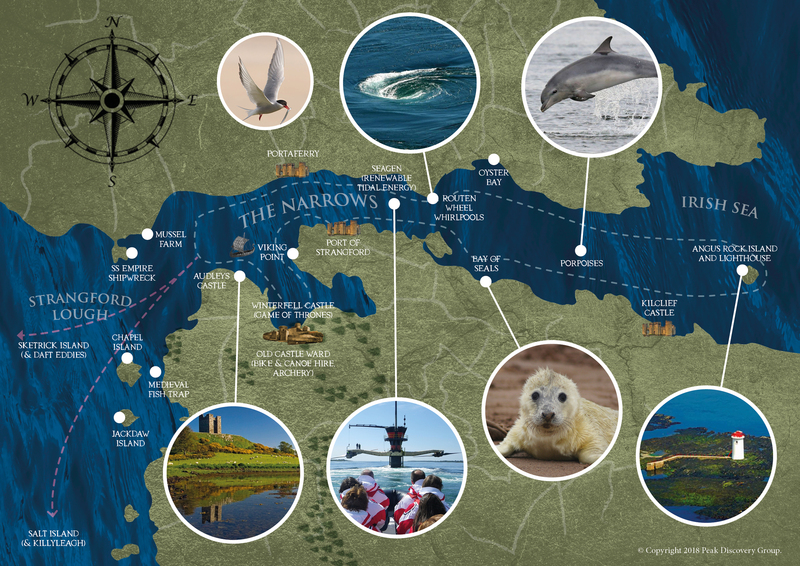 A voyage on Strangford Lough is a ‘must do’ – the tide Ebbs & Flows through the loughs mouth known as the ‘The Narrows’ passing by the ancient castles which guard its shores and around its many ‘drumlin’ islands. The lough is a haven for marine and bird wildlife many of which have migrated all the way from the other side of the World – it is now a designated World Marine Nature Reserve and rightly so – Seals and Porpoises frequent these waters, Dolphin sightings are on the increase and many migratory birds including Brent Geese and Arctic Terns visit every year. The loughs striking landscapes and crumbling castles have also attracted many Hollywood Film Productions companies – Cinderella, Game of Thrones, Disney, Frankenstein, Vikings to name just a few, have all been filmed here in a recent times. Vikings pillaged these shores many years ago in their ‘long boats’. As you voyage across the lough breathing in lungfuls of the purest Irish Sea air and watching the tide Ebb & Flow you soon realise how the lough got its name ‘Strangfyorthe’ an old Norse name meaning strong fjord. Our boat tours are peppered with nuggets of interesting info. along the way as our local and safety conscious skippers impart their knowledge and passion for this wonderful area and take you to the ‘best spots’. Option 2 – Pre book seats on your preferred time slots on our scheduled ‘PUBLIC OPEN DAYS’ – please see below for 2018 calendar dates.